The Herobook has a surprisingly nippy CPU and a massive battery, but we fear that corners have been cut far too deeply. The keyboard is one of the worst we’ve encountered, and the 1366 x 768 resolution screen is no longer fit for purpose, now that we’re almost two decades into the 21st Century. Some 12 years ago, Intel and Asus introduced the netbook to the world. Before then, laptops were expensive and bulky, but the EeeBook changed all this by providing a capable device for not a lot of money. Fast forward to 2019 and Chinese vendor Chuwi seems to want to emulate Asus with the Herobook, a laptop that sells for $199.99 and comes with something you won’t find anywhere else. Online Chinese retailer, Gearbest, sells the Chuwi Herobook for just $199.99 at the time of writing. Note that while this price includes delivery, it is exclusive of any taxes that may be levied by HMRC or the courier companies on behalf of the vendor. Want to buy tech from online Chinese retailers? Read this first. 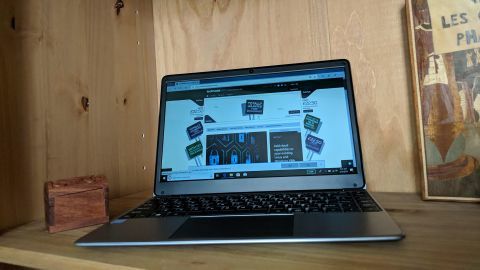 The Herobook borrows the same chassis as the LapBook SE, another Chuwi device that we tested in September 2018. Like that laptop, the Herobook design gets its inspiration from Apple’s iconic MacBook range, featuring a single black hinge, an oversized touchpad, and a brushed metal finish (though the Herobook space grey chassis is plastic through and through). Chuwi has ditched the backlit keyboard and the tacky glowing logo from the LapBook SE, and the Herobook has thinner bezels as the 13.3-inch display makes way for a 14.1-inch model. The four round rubber feet are still present on the bottom, as is the spare M.2 SSD slot which is also on the underside. At 332 x 214 x 21.3mm with a weight of 1.46kg, its size is dangerously close to some of the thinner 15.6-inch laptops on the market. This laptop has no fans and no air grills to dissipate heat. Like the LapBook SE, the proprietary power port, a USB 3.0 connector and a mini-HDMI port can be found on the left, while a microSD card reader, a USB 2.0 port and an audio jack are located on the right. Chuwi chose to use the X5-E8000, an Intel Atom processor, to power the Herobook. On paper, it is a lightweight offering with a low base speed and small amount of cache at 2MB. However, Passmark scores show that, in actual fact, it is more powerful than other popular Intel CPUs in the same price range (N3350 or Z8350), and it’s not far off the stalwart of the Atom X family, the X7-Z8750. Launched nearly three years ago, it belongs to the Braswell family, and is manufactured on 14nm technology, with a TDP of only 5W. As expected, it has four cores/threads and a low base clock speed of 1.04GHz. It does have a few surprises like a rather high graphics base clock of 320MHz, support for three displays (via the N3000 on-board graphics), dual memory channels and a plethora of advanced features. The rest of the configuration is underwhelming: 4GB of LPDDR3 memory, 64GB eMMC storage (the ubiquitous SanDisk DF4064), 802.11n Wi-Fi courtesy of Realtek, plus a hatch to fit an additional M.2 storage device. The notebook also runs with a 1366 x 768 resolution 14.1-inch matte display, along with a surprisingly large 43.8WHr battery. Why did Chuwi use the E8000 CPU? To say that Intel has had some issues with processor production would be a major understatement. Supply has been tight, especially for smaller vendors like Chuwi who have had to fight for scraps. The X5-E8000 – which is not present on Intel’s official price list – is almost twice the price of the X5-Z8350, and is an embedded processor (as opposed to a mobile CPU). It looks likely that this E8000 stock was surplus to requirements, and disposed of in a market it was not originally intended for. The left-hand side of the laptop became warmer under load, which isn’t surprising given that plastic (which the chassis is made of) was never a good heat dissipater. The matte IPS display was reasonably bright without overdoing it. The colors weren’t as punchy as you’d experience on a premium model, and the fact that an HD+ display – rather than Full HD – is used might have been a step too far in the cost-cutting process. The biggest disappointment, though, is with the keyboard. It feels mushy, has a lot of flex, and touch typing on it sounds like you’re hitting an empty metal drum at times. It lacks the substance and the character of keyboards found on more expensive notebooks. The adage “you get what you pay for” sadly holds true here. This is a shame as Chuwi struck the right balance by making judicious use of the large real-estate available – the keys are larger than usual, with dedicated home/end/page up/page down keys present, which are very welcome. As for the performance, the Herobook sits somewhere between the Z8350 and the N3350 processors. It posted some of the lowest scores we’ve seen to date across our wide range of tests, but that was expected. What really counts, however, is that this is one of the cheapest laptops on the market, and despite these benchmark numbers, it is usable. One last note – the battery life of the Herobook was better than expected at 5 hours 15 minutes. One might think that competition at the lowest end of the market might be non-existent, but that is far from the case. There is actually another laptop that costs $199.99 and that’s the Aiwo i4, a slower X5-Z8350 device, but with twice the storage of the Herobook and a Full HD display. So corners have been cut by Chuwi. The Acer Laptop TravelMate B1 costs $189.99 at Newegg on sale. It runs with a Celeron N3060 processor, a smaller display, and Windows 10 Pro, the latter being a clue to its intended target audience. The Lenovo 100e is also powered by Windows 10 Pro and retails at the even cheaper price of $187 at Provantage new. It is equipped with the Celeron N3350 CPU, though, and is a rugged device aimed at the education market. There’s much to like about the Herobook, but it is a tough sell given that better known brands with local support are available for a similar (or cheaper) outlay. True, the Herobook delivers great value for money at this price point (sub-$200), but as is often the case with value products, too many corners have been cut to meet that price barrier. If money is tight but you still want a quality laptop that can perform for your business, then check out refurbished Grade-A models with at least a 12-month warranty from the likes of Amazon, CEX, Best Buy, eBay, Tigerdirect or Newegg.